Mortuary attendants at the 44-year-old Bomadi General Hospital, Bomadi in Bomadi Local Government Area, Delta State, stack corpses on improvised wooden platforms after embalmment and bizarrely abandon them to the vagaries of the weather, day and night,Vanguard reports. The eyesore, is due to lack of space to preserve the dead bodies in the hospital’s overflowing mortuary. Meanwhile, patients have expressed disgust at the dilapidated condition of the health-care facility plagued by rats and mosquitoes, which has heightened the fear of Lassa fever and Zika virus in the riverside community. 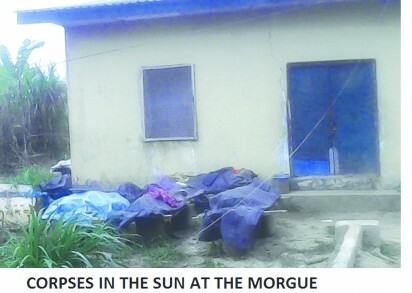 When Niger Delta Voice visited the morgue, reporters saw embalmed corpses covered with blankets deserted. Efforts to speak with some of the doctors were futile, as none of them agreed to comment on the situation. Workers, who spoke on condition of anonymity, said they were under pressure on daily basis because of the challenges faced by patients. “I am a barrister of nine years in the bar, I came to this hospital because of the health of my wife and my experiences here in these two days are pathetic. There was no electricity and water in the hospital premises, a state government hospital for that matter. Corpses stacked outside the morgue “In the night when the rechargeable lamp we were using went off, rats came out in large numbers and spread everywhere. Some of them came specifically for the bread I bought for my wife, dragging it with me. “Out of fear, I took the bread and made it a pillow at the head-side of the bed. I was, however, uncomfortable with it because of its shape and so I decided to put it in a cupboard-like shelf there. When I opened the shelf, I saw that it was a haven for rats. There were so many rats that I became afraid being aware of the prevalent Lassa fever caused by rats. We could not sleep at night these two days we were there,” he said. Leader of Bomadi Legislative Assembly, Hon Bekes Tonprebofa, who was a patient in the hospital, last year, complained bitterly about the state of the facilities, appealed to the state government to do the needful in the hospital. Contacted on phone, Commissioner for Health, Delta State, Dr. Nicholas Azinge, said he was not aware of the development and promised to investigate the matter. Not a good omen—Royal father Traditional ruler of Kpakiama urban community, Chief Ambakederemo Bunu, who expressed dismay that corpses litter the outside of the mortuary, said it could lead to outbreak of both air and water-borne diseases and called on government to quickly intervene and save lives of the rural dwellers. He also noted that the presence of rats in a government health-care facility at this time of Lassa fever disease was not a good omen for the people.